As "progressive" and enlightened as American society claims to be, it sure doesn’t seem so when one looks at how often it marginalizes the mentally ill. Misconceptions, myths, and subsequent stigmas continue to circulate, making life absolute hell for patients already suffering from serious medical conditions. Despite this social isolation, plenty of empowered individuals take up their writing implements and use their realities to completely dismantle common, wrongheaded assumptions. Memoirs about mental illness are more or less a subgenre all on their own, and any author willing to put him- or herself out there in the interest of education deserves commendation. Listed in no particular order, and never meant to discount the brave contributions of other writers, the following 20 reads make a great place to start learning about mental illness from a first-person perspective. As literature is, of course, entirely subjective, try not to pitch a wee hissy over inclusions and exclusions. Girl, Interrupted by Susanna Kaysen: In this famous memoir of mental illness, author Susanna Kaysen chronicles her stint in a psychiatric hospital at age 18. She received a diagnosis of borderline personality disorder, a condition largely overlooked and misunderstood by the American mainstream, and relates all the intimate details back to readers. Not only does Kaysen’s autobiography shed light on BPD’s many nuances and symptoms, she also critiques the mental health care system. Hurry Down Sunshine by Micheal Greenberg: Lauded by critics at Booklist, Library Journal and The New York Times Sunday Book Review, Hurry Down Sunshine revolves around a father coming to terms with his daughter’s mania. With brutal intensity, he opens up about watching his beloved Sally succumb to her brain chemistry. Psychiatric illness does not only impact the suffering individuals — it physically, mentally and emotionally resonates with the ones who love them most. Blue Genes by Christopher Lukas: Bipolar disorder, depression and suicide run rampant throughout Christopher Lukas’ family, claiming both his brother (Pulitzer-winning journalist J. Anthony Lukas) and his mother. His aching memoir traces how generations pass on their conditions and come to impact loved ones. It’s an agonizing read, but one wholly necessary to understanding the nature of mental illness. 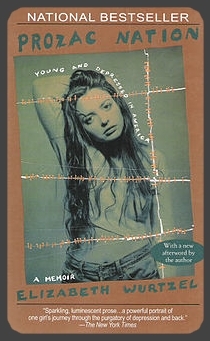 Prozac Nation by Elizabeth Wurtzel: Major depressive disorder descended upon writer Elizabeth Wurtzel during her college and young professional days, after a lifetime of loneliness and longing for an absent father. Like many individuals suffering from this agonizingly common condition, she turned towards substance abuse and even a suicide attempt as a means of self-medicating. But a combination of steel will and a determined doctor set Wurtzel back on the difficult road to recovery. Wasted by Marya Hornbacher: All the eating disorders remain some of the most misunderstood, yet high-profile, psychiatric conditions. This Pulitzer finalist defies many of the unfair stereotypes levied onto those with anorexia and bulimia, approaching the subject matter with intelligence and openness. Wasted candidly discusses a 14-year struggle with eating disorders and their comorbid diagnoses. An Unquiet Mind by Kay Redfield Jamison: As both a clinical psychologist and bipolar patient, Dr. Kay Redfield Jamison speaks about mental illness from a very unique perspective. She has written extensively about her tumultuous experiences in various books, but none more personal and evocative as An Unquiet Mind. Ultimately, Jamison concludes that despite the horrors of suicide and searching for a valid treatment option, she feels her experiences made her a better person. Just Checking by Emily Colas: Just Checking covers Emily Colas’ life with severe obsessive-compulsive disorder, starting with her childhood and moving up to marriage, motherhood and an emotionally-ripping divorce. Rituals and compulsions meant to quell her fears eventually isolate the people she loves most, and it isn’t until she hits the bottom when psychiatric treatment becomes an option. Much of the memoir also covers how OCD severely impacts college students, sometimes driving them towards substance abuse as she once did. Darkness Visible by William Styron: After a lifetime of alcohol abuse and sedatives, the celebrated author of Sophie’s Choice and The Confessions of Nat Turner discovered he suffered from depression. Such a revelation, popping up in his 60s, guided him down a path of self-analysis and forced him to analyze of his experiences up to that point. Comparing and contrasting his melancholy with that of other famous figures who struggled with depression brings peace and reflection. Skin Game by Caroline Kettlewell: Self-mutilation, often (but not always) involving cutting, crops up as a sadly common method of dealing with numerous psychiatric illnesses. In this emotional, deeply personal autobiography, Caroline Kettlewell explains how slicing herself with razor blades brought solace during her isolated childhood. As of its publication, she was still coming to terms with the issues inspiring the painful actions. Unholy Ghost edited by Nell Casey: Twenty-two writers, including such luminous names as Larry McMurtry and William Styron, contribute their voices to this provocative anthology. All of them shed light on the realities of prolonged depression, allowing readers to analyze commonalities and understand unique experiences alike. Because the condition takes on so many different, ugly forms, anyone wanting to know more about it would do well to explore this volume with an open mind. The Quiet Room by Lori Schiller with Amanda Bennett: Wall Street Journal reporter Amanda Bennett teams up with the courageous Lori Schiller to educate readers on schizo-affective disorder and the dangers of ignoring symptoms. Plagued with auditory hallucinations and suicidal thoughts, Schiller attempts to eke out a "normal existence" by seeking no treatment whatsoever. And, in doing so, ends up losing control of everything — though her story thankfully ends on an upbeat, hopeful note. Musical Chairs by Jen Knox: A melange of family psychiatric history and struggling to fit into American suburbia sits as the main theme of Jen Knox’s Musical Chairs. Both factors contribute to the author’s nightmarish encasement in substance abuse and sexual objectification, but she eventually realizes how much she really needs her loved ones. Knox grapples with the myriad emotions attached to removing herself out of isolation and into treatment and resolution. Drinking: A Love Story by Caroline Knapp: Untreated and unacknowledged mental illness often — but, of course, not always — leads to substance abuse issues as a means of alleviating the anguish. Caroline Knapp slowly succumbed to alcoholism after struggling with anorexia, both of which were unfortunately exacerbated by her high-pressure parents. Until age 36, this Brown-educated journalist kept the demons suppressed from employers and loved ones before finally checking into rehab. Running with Scissors by Augusten Burroughs: Augusten Burroughs’ mother sent him to live with her psychiatrist at age 13 after their tragic, unhealthy family life finally collapses in on itself. But even then, the new household contains some bizarre dysfunctions of its very own — including pedophiliac encounters with another adopted son twice Burroughs’ age. Psychology buffs with an interest in the nature versus nurture debate will particularly find his narrative fascinating. Electroboy by Andy Behrman: Electroshock therapy has a very negative reputation, but in reality it can actually help patients suffering from a number of different psychiatric conditions. Andy Behrman’s manic depression (now known as bipolar disorder) drove him to actions both thrilling and utterly destructive, ultimately landing him in prison when his confidence became so overwhelming he forged paintings. Once he resigns himself to doing whatever it takes to feel well and whole, a combination of the right medicine and electroshock proves successful. Sickened by Julie Gregory: Julie Gregory spent her childhood forced into illness because of her mother’s Munchausen by proxy disorder. In the very first memoir of its type, she chronicles the horror of constant physical abuse and how she weathered it hoping to please mommy. Gregory learned of MBP in college, and from there confronted the lie that had been foisted on her since birth. When Rabbit Howls by Truddi Chase: Because of childhood sexual abuse and exploitation, the author began retreating inside herself and displaying the symptoms of multiple personality disorder — a condition oftentimes wrongfully confused with schizophrenia. Her memoir was one of the first to address the issue from a patient’s perspective rather than that of the doctor, and proved unique in her refusal to condense the different personalities down. Rather, Chase worked towards organizing them into a cohesive team dynamic. A Drinking Life by Pete Hamill: Sexual frustration and anxiety drove writer and journalist Pete Hamill to begin abusing alcohol in adolescence. All he wanted in life was escape, and the desire sent him on even more voyages — many of them reckless or poorly considered – than the ones booze provided. Many note that this memoir isn’t exactly a detailed peek into alcoholism and regaining self-respect, but it is notable for its influence on Caroline Knapp’s Drinking: A Love Story. Lucky by Alice Sebold: Not all mental illnesses come from trauma; not all traumas inspire mental illness, but the two still walk hand-in-hand in plenty of instances. Bestselling author Alice Sebold was brutally raped during her freshman year at Syracuse, and viscerally bristled when a cop told her she should feel "lucky" not to have been murdered like an earlier female student. The incident, along with her upbringing as the child of alcoholics, thrust her headlong into depression and a brutal heroin addiction. Stalking Irish Madness by Patrick Tracey: Because family history and genetics oftentimes dictate the mental health and stability of succeeding generations, it makes sense that many memoirs covering the subject delve deeply into such themes. Schizophrenia plagues Patrick Tracey’s sisters, and he devotes time and resources to tracing the diseases’ origins in his lineage. While he dredges up plenty of ambiguity and even more questions, the book does serve as an honest glimpse into an incredibly misunderstood condition. This entry was posted on Wednesday, May 18th, 2011 at 11:34 pm	and is filed under Health News. You can follow any responses to this entry through the RSS 2.0 feed. You can leave a response, or trackback from your own site.